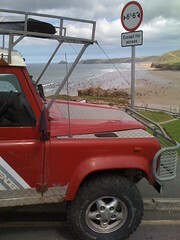 Bulletin: We have finally decided upon a name for our Land Rover. Tess, short for Temeraire. Named after the Turner painting of the old warship being dragged in for scrap at the end of its days, temeraire (where we get the word temerarious) is French for foolhardy bravery. We felt all these things summed the expedition up. Like each city before us, the map of Khartoum gradually gained meaning. We painted the birds-eye roads and rivers with minds-eye pictures, adding personal landmarks. The GPS stayed locked in our central console now, as we instinctively navigated to the best coffee in the leafy diplomatic quarter or to the reliable mechanic in the ramshackle industrial district (dust being the operative syllable). Moving on left a nagging question as to the futility of all this knowledge, should I never return to this particularly welcoming of cities. We had a grounding not only in the geography but in the language, the mannerisms and customs; all essential for turning survival into enjoyment. We had friends here. Was all this now to be reduced down to a few choice anecdotes or an occasional feeling evoked by a mood or smell? This is a question that has, for a long time, harassed me. We accumulate so much experience that we will probably never have the chance to use. However, in an uncertain future, you can never appraise the key piece of information you will need. Also, it’s amazing what comes in unexpectedly useful. So for the meantime I will continue to assimilate everything memorable enough to remember. And – as if to affirm this decision – here I was, returning to Ethiopia after two years, equipped with little useful knowledge remaining, but with a constant sense of Déjà-vu. At Khartoum, The Blue and White Nile meet (although the two great waters travel onward for several miles in the same bed, coyly eyeing each-other up before finally merging). The team had decided that for continuing upstream, the smart money was on Blue. 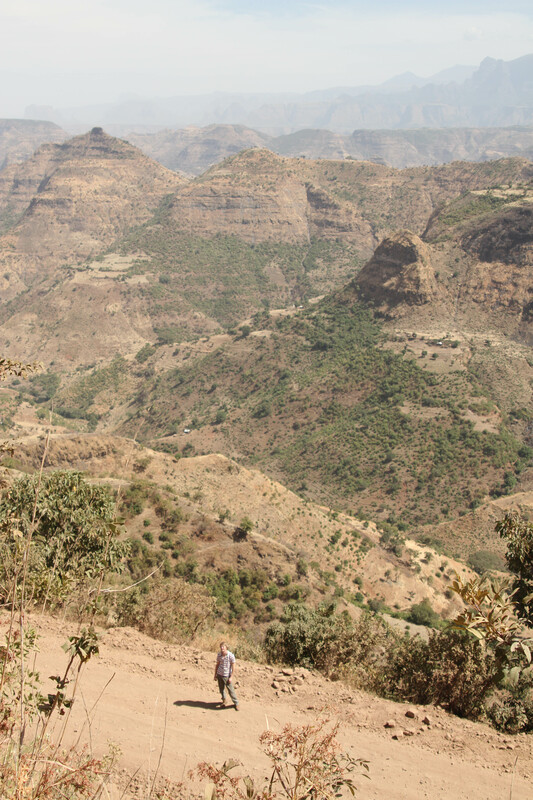 The source of our chosen river lay far away (and up) in the mountainous enigma that is Ethiopia. Incidentally, the team was now down to the original three. Our Swiss support car had driven on ahead, Bob had cycled off into the desert with 500ml of water and a bag of dried pasta and our French hostesses had chosen continued employment over the romantic life of an African Overlander. Light and efficient, the expedition struck South-East. Each day’s drive saw the Sahara gradually change into scrubland, then savannah. The land filled up with huts, tracks and people. The grassy bush was far overhead as we steered off for our final camp in the remote borderland. The dense vegetation was thick with nature and the suggestion of human activity. We hid in a dry river bed. As the sun set, I snuck off alone, using the riverbed as a path through the imposing grass and vicious thorns. I left the safety of the riverbed to photograph a pair of Hornbills, buoyant in the cooling air. Keeping a vague eye on the route I climbed up a hill to watch the sun-set. As I sat under a flat-topped tree, the hills reddened with the scything clouds. A flash of improbable cyan caught my eye. An Abyssinian roller glided between trees. I followed it in the tunnel vision of my binoculars, followed it across a smudge of dark trees and past the wide-eyed shock of a human face. I was being watched with a transfixed but unsure grin. Nearby, there were other dark figures in the gathering shadows. No stranger to trespassing in the English countryside, the sensible, mature thing to do at this point would have been to casually wave, acknowledging discovery and then begin an exaggerated act of looking for a footpath or disobedient spaniel. However in my short spell of African solitude, I had lost perspective. I legged it over the brow of the hill. Diving into a beastly thorn-thicket, I hid, scanning the horizon. I was not obviously followed. Back at camp, Dan and Rich were sitting on the roof serenely sipping coffee, trying to ignore the frequent kamikaze cricket face-strikes. I rolled out of the bush, wide eyed and grazed, much to their mirth. If we were watched that night, we were blissfully unaware. I like to think that back in a village in a forgotten corner of Sudan, a similar story is being told about our brief encounter. The following morning, still hidden below ground level, Rich became acquainted with the dark and delicate art of chassis stamping. Not having a chassis number in Africa is not an option as our time in Egyptian captivity had demonstrated. Nobody in Khartoum was prepared to stamp us without a letter from the police, who would certainly confiscate our contraband car, so we were forced to take matters into our own hands. Many African borders are arbitrary, difficult to define lines, representing a gradual merging of cultures or a post-colonial carve-up, dividing kinsfolk. This is not the case for Sudan-Ethiopia. The tapering straight road was covered with people, carts and livestock. In the distance the border stood like the finish-line to a chaotic race. Beyond it rose the highlands. As usual, crossing it involved a convoluted precession of customs checks, stamps and above all, waiting. Our new chassis number was inspected, passed without a second glance and we were through to Ethiopia. In an instant, we had traded semi-desert for fiercely undulating stacks of fertile earth, the long straight asphalt for a road that climbed and wound for hours before shearing away, and a sparse and easy Islam for a teeming and ancient Christianity. The last time I had visited the country, studying in a remote hospital, it had been in rainy season when all the mountains were butcher’s-grass-green and heavy with clouds. Now the fields that covered all the available flat ground were bare and flaxen, the mountains were naked and striped in blood reds, volcanic blacks and sandy yellows. The switchback turns slithered under escarpments and over passes. Villages were frequent, wooden houses and thatched huts that lined a road used more as a common space for people and livestock than a conduit for vehicles. Rural Ethiopians (95% of the 90,000,000 population) have little to no concept of road safety or even how traffic functions. We braced ourselves for each village, donkeys, cattle and goats lurched across the road, docile until realising the car was behind them, then stood rigid in terror or bolted unpredictably. The people behaved in a similar way. Watched by the entire town with neutral stares, the innumerable children chased us with the cries of ‘You! You!’, ‘Faranji!’ (a slightly derogatory cross between foreigner and stranger) or just threw stones. Women, a species we dimly remembered from before Egypt and Sudan, were as confident as the men. Each time we stopped the car, a crowd would grow and the windows would be darkened by staring faces and touching hands. Each interaction was a blank canvas, smiles and frowns being quickly reciprocated. One theme was consistent, everyone expected a handout of money. That night we tried to camp in a hillside forest. Driving off a troop of unwelcoming monkeys, we sat on the roof of the car, gazing over the evening vista and had a beer, an actual, legal beer. However our the peaceful solitude we had become accustomed to in the Sahara was soon interrupted by people emerging out of the forest. We mistook one man who was particularly keen to meet us as the owner of the land. In a drawn out misunderstanding we fed and watered this hermit who slept by our fire before wandering off in the morning, taking my towel with him. To gain some understanding of the people who inhabit these highlands, they need to be put n historical context. Civilisation may well have begun here, tracking up the Nile. Judaism and then Christianity took root here before most of the world. Islam surrounded, but never significantly penetrated the mountain plateau. Cut-off and surrounded by enemies, the kingdom of Ethiopia forgot the world and in turn was forgotten. The outside was denied a story of centuries of holy emperors and warring dynasties. When they were rediscovered, a feudal system of Nobles, priests and endless peasants was still fully intact. In fact the Empire remained un-colonised and resistant to change until events overtook it with the Italian invasion of 1936. Liberation followed soon after with the enthralling Emperor Haile Selassie returning from exile in Jamaica (where he had inadvertently founded Rastafarianism). Despite his international appeal he failed to spot the need for reform and was unceremoniously ousted by the sinister ‘Derg’. This communist military council was highly oppressive, mismanaged the economy and diverting the much of the international aid Ethiopia is famous for receiving, into the military. The bloody civil war that removed the Derg created a crudely democratic federation of states who struggle to see eye-to-eye. 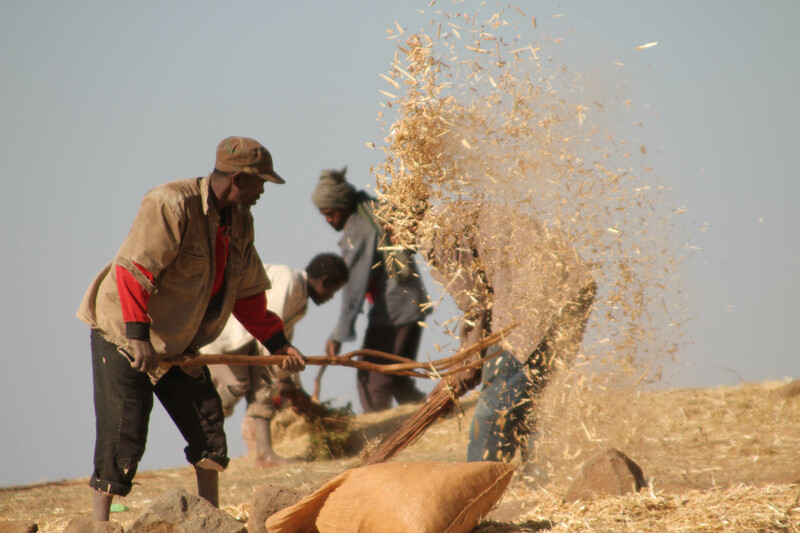 Throughout this time Ethiopia has been at the sharp end of international aid: large short-sighted projects doomed to fail, food handouts, and money which disappeared into the beurocratic ether. As a result of this complicated history, the Ethiopians are themselves complicated. Much of the country remains ‘feudal’, the educated classes and the clergy sit atop an expanse of semi-subsistence farmers living as their ancestors did. Probably a hangover from the Derg, there are layers of government officials, entitled and stifling change. Fiercely proud of their isolated history, they are prone to xenophobia and anger over the wealth discrepancy between them and the ‘Farangi’. The malignant effects of last century’s blind aid are all too apparent. Tourists, who no doubt have contributed to the problem, are expectantly mobbed in every village. Cyclists, as our friend Bob found out, are stoned. All this said, when befriended, Ethiopians are sharp, subtly humorous and take hospitality very seriously. This depth of character takes time to break through to, a big problem for our fast moving expedition. This is why the city of Gondar, where we would spend over a week, was a nice break from our constant migration. Gondar is the old capital and holy city of emperor Tewodros. Centred round a grand castle, its cobbled hillside streets link the countless churches. We had arrived here in time for the greatest show in Ethiopia: the festival of the Epithany, or Timkat. Here, during four days of celebration the tablets bearing the commandments from each church are baptised in the pool and moved in an enormous procession back to their churches. Here we were also expecting to do two other things: visit the Gondar (Ethiopia) Eye Surgery (GEES) project to which we have been donating half our sponsorship money and to join up with Megan, a good friend who was bravely coming to visit from Cornwall. We set up camp in the shady, lush gardens of the grand but decaying Terrana hotel. Before the festivities began we were able to meet up with Dr Asamere, consultant eye surgeon. Over lunch we talked at length about the state and aspirations of the project but also about history, culture and football. He offered not only to take us around the eye hospital but also to show us the highlights of Timkat. GEES was set up by a British eye surgeon, Sandy Holt Wilson, who identified the need for the project whilst working in the region. Starting small, GEES has supported a new eye hospital, providing a consultant ophthalmologist and equipment. It is also now training ophthalmologists and specialist eye nurses setting up a new teaching facility and library. The burden of disease (largely blindness from cataracts, infection, deficiency, injury and diabetes) and the area covered is huge. However the project is growing slowly but realistically toward making Gondar a centre of excellence for eye care. There is a real feeling of progress at the hospital. The excitement had been building like a thunderstorm when the first parade broke. In the main square, hundreds of pilgrims clad in pure white shawls followed a blaring procession of music, archaic guns, swords, jangling umbrellas, cracking whips, intricate hairstyles and harlequin uniforms of outrageous silk. Every village, church or civic institution seemed to be putting on a show. The following morning, we met Dr Asamare down at the Fasilidas baths, a fascinating, fortified swimming pool like structure build in the 1600s. The first tablets had been baptised and the waters blessed. The sun-dappled waters writhed with hundreds of bronzed bodies, merrily splashing in this holiest of leisure facilities. We followed in the path of the tablets in a procession of thousands that dwarfed the day before. Carnival floats, co-ordinated dances and bearded holy men carrying staffs and ornate crosses were now added to the mix. Unfortunately, Megan’s plane was grounded in snow back in Bristol, a concept that was difficult to fathom as we sought refuge in all available shade. However, she was touching down the next morning for another big day of festivities. Rudely awakened by the burning sun, we pressed on. We watched the kilometres slide past, the landscape intermittently punctuated by ancient pyramids. Even with a solid road it took three full days to cross the desert, North to South. We arrived into central Khartoum almost unexpectedly. In the dead of night the suburbs gave way to the deserted streets, ramshackle buildings, and clouds of swirling rubbish of the city centre. We were exhausted and underfed, which are sensations never conducive to a positive state of mind. We went to bed with our hackles up, worrying about our car on the street outside. 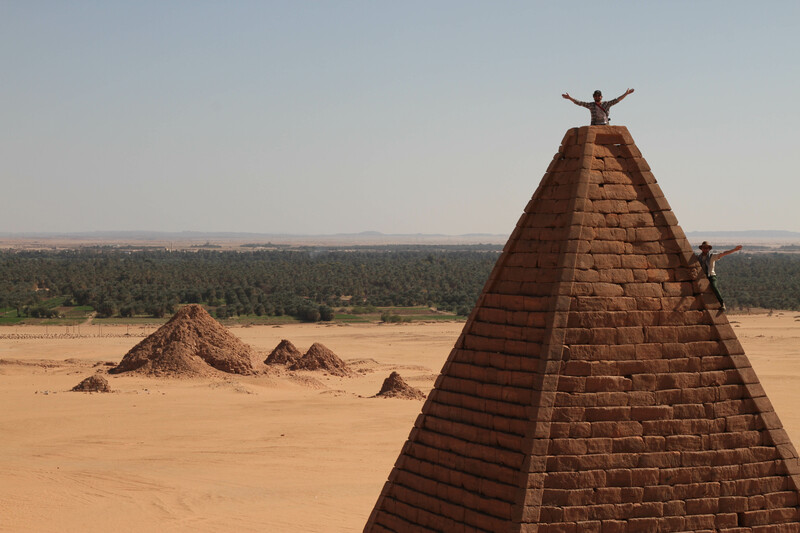 Until now our experiences in Sudan had been universally positive. In fact, we had relaxed more in this country than any other since Greece. More than once we had been lax. On the first such occasion, a member of the team who shall remain nameless (Rich) managed to leave the ‘People’s Folder’ containing three passports, carnet de passage, US dollars, immigration documents, and generally everything we hold dear in a market stall in northern Sudan. On the second such occasion, a member of the team who shall remain nameless (Rich) managed to leave the ‘People’s Toolbox’ by the car on a busy street. On all such occasions we had had our missing items returned to us within hours, or frantically retraced our steps only to find our precious belongings in the grinning hands of the stall owner, with offers of tea and chewing tobacco (generous, but sadly a futile offer in the case of the latter!). Our arrival to Khartoum in such a state sowed the seeds of doubt in our minds, and we wondered if all the doubtful looks and raised eyebrows when we mentioned Sudan in conversation at home had been justified. We were pleasantly surprised when we awoke in the morning. Bustling and colourful, the streets had transformed into a melee of trade and commerce which felt positively relaxed after the ruckus of central Cairo. We breathed a sigh of relief and went about our business feeling safe and welcomed. We were up and on a mission: car repairs. After a small fiasco where our GPS entertained the belief that it resided in Mali, we made our way to the industrial car area. Here shacks baring the emblems of every car manufacturer imaginable tripped over each other into the compacted earth street. Cannibalised skeletons lined the roads, their stripped chasses serving as benches for overall clad mechanics methodically putting the world to rights over chai. A donkey passed, pulling a cart piled high with modern plastic car body panels, the cart its self supported by a Land Rover Series II axle with hand-made wooden wheels. Nothing is wasted in this country. After much well-meaning small talk, we found Abdullah, an angle grinder enthusiast with hands made of elephant hide, who happened to also have talents in the area of bodywork reconstruction. Explaining to him the concept of repairing significant portions of our rotten bulkhead required two rounds of incredulously sweet tea, three separate interpreters, much pointing, and most of the morning. 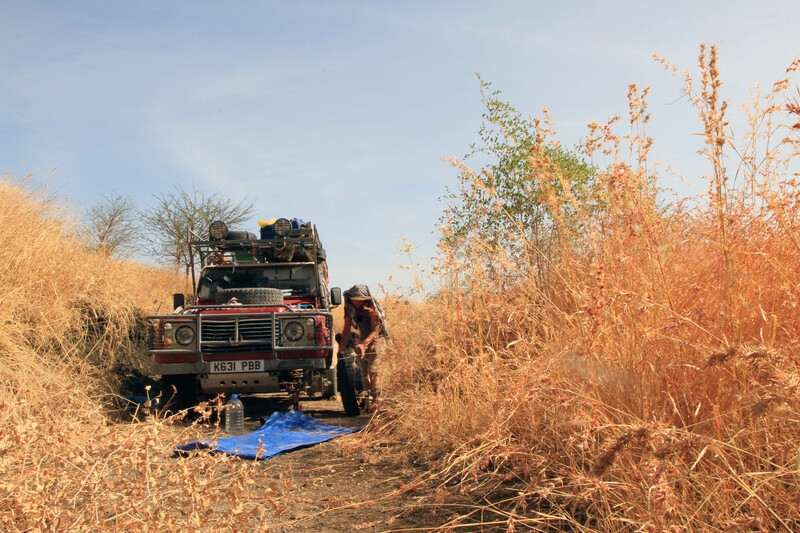 It requires a hearty amount of trust, desperation, or perhaps stupidity to let an overly zealous Sudanese man with a blowtorch anywhere near your belov’d Land Rover, even if it does look like a rusty shack. We sat in the sun for two nail-biting days, watching Abdullah slowly reconstruct the wounds he had inflicted on the car, affirming the faith that we had placed in him as he did so. Our doors were giving up the ghost, and even our complex system of plywood, brackets, and bolts was struggling to hold them together. We found an old Land Rover in the back of a garage who had sadly passed on, and with Abdullah’s help negotiated the salvage of her two back doors. Rust doesn’t exist as a concept here, and they were solid. A further days work saw them hanging proudly on our steed, brightly discordant but gloriously unyielding to rain or rascal. We were invited to stay with three young employees of the French Embassy in Khartoum. Manicured gardens and tasteful buildings lined the streets of the expat district, and we felt uncouth as we growled our way towards their house in our newly piebald monster. We were ushered into a cool, spacious flat with soft accents and a hint of perfumes long forgotten. We had stepped into a world of saussison, rich chocolate, and Pastice. Conversation was animated, company excellent, and accommodation luxurious. We couldn’t believe our luck. The expatriate scene in Khartoum turned out to be a close-knit international community. Given Sudan’s political instability, the majority are young workers without families. Alcohol is strictly illegal in Sudan, with the disobedient facing fourty lashes* as punishment. However, a strange agreement exists where embassies arrange regular imports of liqueur for their employees while the authorities look the other way. These two factors results in a strange and vibrant social scene which harks back to the era of American prohibition. The gatherings are highly lubricated, all the more fun because they are forbidden. Despite the fact we have managed to talk our way across two of the hardest borders of our trip with only half a vehicle identification plate and no chassis number, our apprehension grows that at some point we may encounter a competent border guard. As such, we spent a memorable morning hunting out the shadier car mechanics in Khartoum and trying to persuade them to engrave our car. We were surprised at their absolute refusal. Residents seem to be terrified of the government’s retribution here, giving the country a very safe yet slightly stifled feel. After much hushed discussion we recruited a local chap and set off in a tuk tuk in search of our own equipment. We eventually found a set of roman stamps imported from Germany. We would have to do it ourselves, and soon, before Ethiopia. *Interestingly the original Aramaic words for ‘fourty’ and ‘many’ were the same, leaving this particular punishment open to interpretation. You don’t need to be a mechanic to go overlanding! However you do need to be vaguely familiar with you vehicle. The most important things are preparation and maintenance. – I would recommend finding a friend/institution to teach you about your vehicle, if you’re not au fait with it already. We spent a few days with Dave in Devon (www.bushmechanics.co.uk). We gained knowledge, confidence, and a good friend. The age old debate about weight vs. probability of use. Lists below assume a transcontinental trip of approx 20,000 miles, and are tailored to Land Rover Defenders. X3-6 20L metal jerry cans, tailored to desired range. Do not transport on the roof if petrol/harardous offroading! X2 paper air filters. Quickly destroyed in the desert. Consider a washable filter such as K&N if planning lots of desert driving. Headlight/starter motor relay. Can’t start the car without one! Side light, indicator, brake bulbs. Can be a pain at a border if noticed to have a light out. X2 sets spare car keys. Recommend wiring one to a hidden location under the car. Chewing gum. Good for shoring up holes in a fuel tank. Tyre valves – if running tubeless tyres, a valve failure can be a pain. Spare fan belt – can use tights/elastic in extremis! Try and do as much vehicle preparation as you can so that you get an idea for what tools you need. Grease gun – ideally one that you can refill from a tub, unless you want to carry all your cartridges with you! Sand ladders/waffle boards. Consider x4 if doing serious/solo offroad. Puncture repair kit. No point having levers without this! This is specifically aimed for those buying Land Rover Defenders, but certain points are applicable to other vehicles. It is skewed towards those buying a Defender for an overland expedition, but is applicable to all potential buyers. Check the DVLA Vehicle Registration Document (V5) details are correct. Compare the chassis number on the V5 with the vehicle its self. On Defenders, you can find the vehicle identification number (VIN)/’chassis number’ in two places: on the VIN plate, located on top of the brake master cylinder at the rear left of the engine compartment on RHD models, and stamped into the chassis on the driver’s side. Look at the chassis under the front wheel arch; it should be in front of the wheel and behind the towing eye. You may need to use a wire brush! Also check the engine number on the V5 matches the vehicle. This number should be punched in to the engine block. Ask about service history. These are often non-existent on old Land Rovers as many owners service themselves. Engine oil and filters should be changed every 6,000 miles, differential and gearbox oils and brake fluid changed every 20,000 miles. When was the timing belt last changed? Have the universal joints been replaced on the drive shafts? Does it have the original brake/clutch lines? When were the brake pads last replaced? A good service history/working knowledge of the car implies it’s been well taken care of. – Is the car level? Sounds obvious, but unladen, it shouldn’t tilt to one side! – Does it idle OK? – Air filter. Take it out and have a look. If it’s full of oil, this implies the engine is running at too high a pressure, suggesting work piston rings or other major issue. If it’s dirty and clogged, it’s a good indicator that the car hasn’t been looked after. – Inspect all the pipes in there – radiator pipes, oil pipes, fuel lines, fuel injector lines, intercooler pipes. Check for leaks. – Check the oil level. If it’s low, again this implies the car hasn’t been looked after. – Test both the High and Low Ranges. Do they select easily, do they jump out gear at all? – With the car stationary, put the clutch in and select 5th gear. Bring the clutch up slowly. It should stall the car. If now, it implies the clutch is slipping. – Does the pedal feel spongy? Implies old brake fluid or master cylinder fault. – Lubricant leaks – from plugs, gaskets, brake or clutch lines, or oil seals (big job). – Check for play in the universal joints. To do this, put the car on the flat and chock a wheel, put the car out of gear and take off the handbrake. Use a flat headed screwdriver or similar to rotate the UJs. There shouldn’t be any play/give in the joints. – Chassis. Classically rusts on Land Rovers! Have a really good look at the front cross member, outriggers, and inside edge of the rear cross member. Use a brush and don’t be afraid to scrub away dirt! Tap with a hammer on any suspicious areas. Land Rovers rust. Despite their aluminium body panels, the framework is steel, as is the chassis and the bulkhead (the large vertical divider between engine and passage compartments). They classically rust through the bulkhead or on the chassis cross members (horizontal bits connecting the left and right main parts). 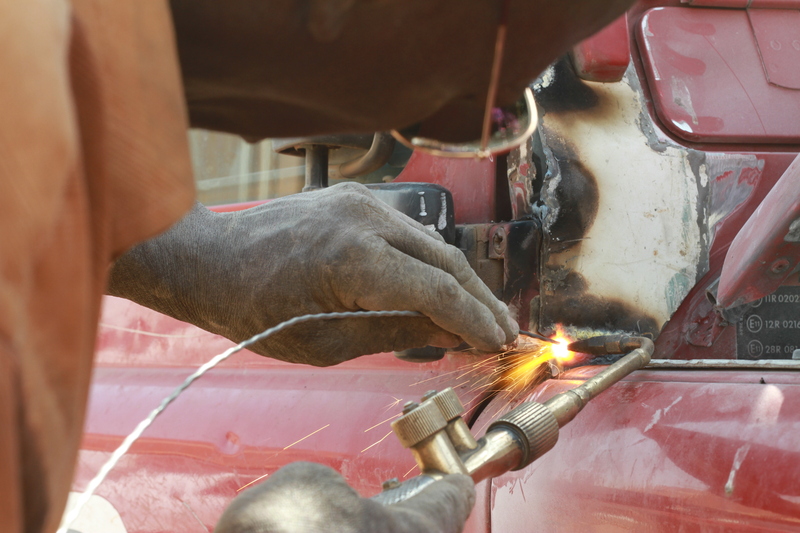 Any serious rust/holes require major welding, which is going to cost an absolute minimum of £100, much more if serious. Galvanised chasses are amazing if you can find them, but bear in mind they won’t have a chassis number which is a problem for African borders! – Chassis. Inspect rear cross member, tap along with a hammer. Look the whole way along either side, especially in the wheel arches. – Doors. Big security issue. I would recommend removing the door cards and inspecting the internal framework. Replacing a door costs £100 or more each. 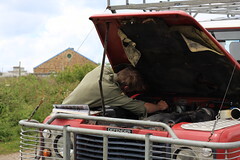 Any Land Rover over 10 years old is at risk of electrical problems. They’re renowned for being very simple circuits (pre TD5) that often fail. – Check all the lights. Potentially costly little things can be worth looking out for if the MOT is about to expire! – Seat belts. Do they retract independently? – Vibration – can be expensive and difficult to find and correct! – Temperature – make sure your test drive is long enough to weed out any overheating issues. – Wheel hub temperature. A hub that is hotter than the rest can imply a failing baring. – Have another look under the car after it has stood for a while post test drive. With the lubricants warm, a leak might be more obvious. Vehicle selection for overlanding is the biggest decision you will make, bar your route, as it will affect your life every day of your trip. The options are described below. Hugely widespread in every European/African country, a Toyota 4×4 will be strong, reliable and good value. Expertise and spares are widely available, even in the back of beyond. 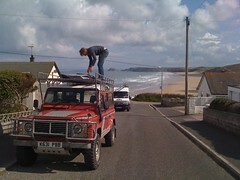 Go for the 70 series, they’re the offroad workhorses, although can be difficult to find in the UK. Former King of Africa, Land Rovers are still mighty beasts, with a strong cult following. In general, in the UK expect to pay between about 120-150% of the price of an equivalent age Land Cruiser, and to get less features (no air con, basic interior, no CD player etc). Realistic options are the Defender or Discovery. If you’re overlanding in a Series III or older, I want to hear from you! Land Rover’s replacements for the Series III were the 90 and 110 models, which they rebranded as Defenders in 1991. The 90 and 110 refer to the length of the chassis in inches, so 90 is the short wheel base and 110 the long wheel base (130 also available, collectors items!). I would recommend the 110 for overlanding, as there’s much more space and you sleep in the back stretched out if you’re 6’2” or less! 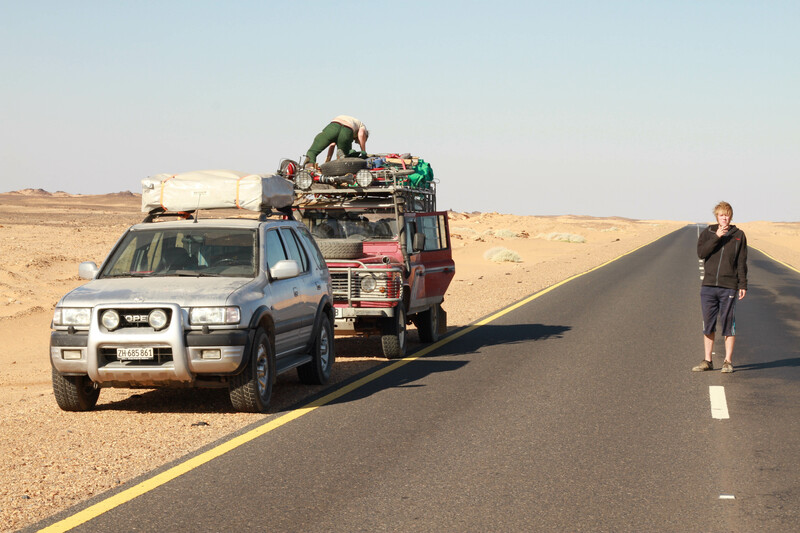 For overlanding, look for the 200TDi or 300TDi engines (1990-1997ish). These are 2.5L four cylinder engine blocks, with a reputation as the best engines LR ever made. They’re simple, will run off poor quality fuel, and have minimal electrics – all positives in developing countries. The turbo and intercooler give them more power than the earlier diesel engines. I would avoid the TD5 or later, as they have too many electronics on board. Out of my area of expertise; buy a diesel (simpler and a more widely available fuel), aim for the 200TDi or 300TDi engines. Nissan Patrol, Toyota Hilux, Isuzu Trooper, Mitsubishi Shogun are all options, but less common. As such expertise and spares are less available. Mercedes UniMogs are for the well endowed/family overlanders. 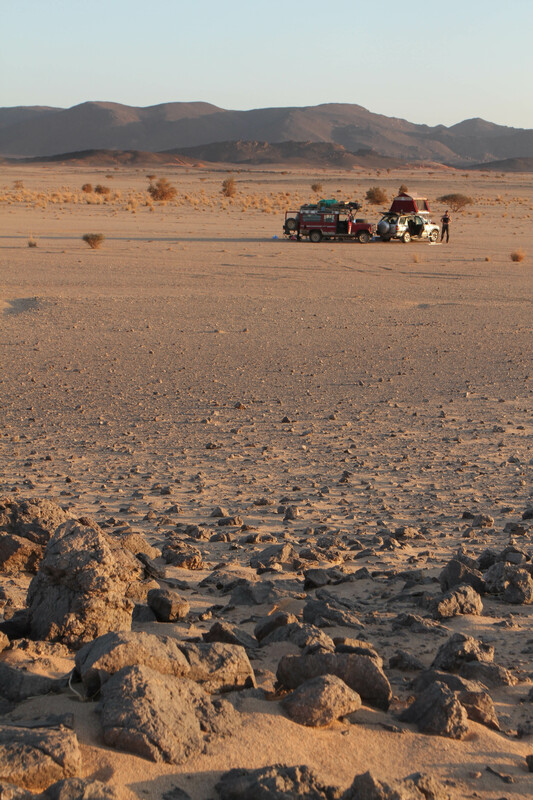 If planning a one-way overland expedition, there’s always the option of starting at the far end and driving back home. Bear in mind that this may require you to spend a long while at the far end organising purchase of vehicle, tools, spares, and documents! Buy a diesel if you’re going off the beaten track. Diesel is more widely available, the engines are simpler and easier to fix, and they’re often more economical. Diesel is also much safer to handle/transport. These look great, but once bent they are good for nothing. Better to opt for steel wheels, which can be bashed back into shape! 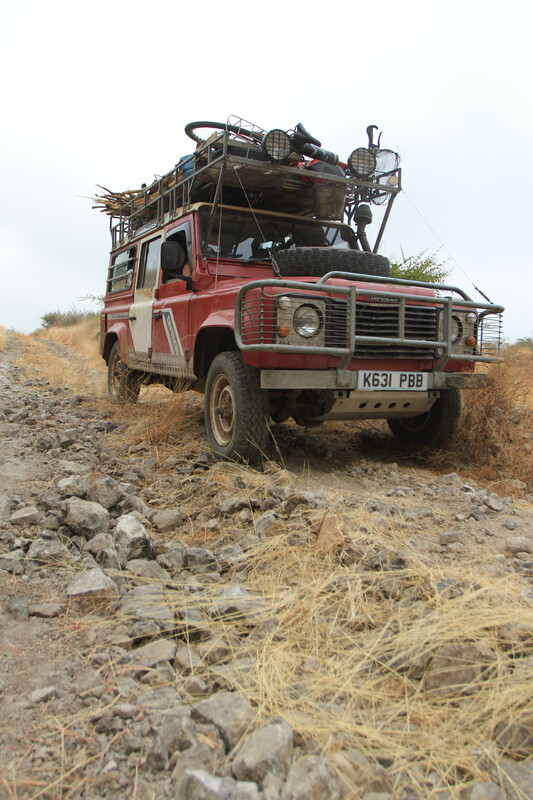 Consider 6.5’ Land Rover steel rims rather than the standard 5.5’, they will let you mount 245 width tyres and above. Often fitted in tandem with alloy wheels, these allow bigger tyres but also put greater strain on the wheel barings and steering mechanism. Your call. Roof rack – a must have. The bigger the better in my opinion, as it gives you the flexibility to chuck everything on the roof. Expensive to buy separately, so aim for a car with one already fitted. Roof tent – expensive, luxurious, convenient. Depends upon your budget. Allows safe and quick assembly of camp, but takes up a lot of roof rack space. A cheap alternative is to line a roof rack with plywood and pitch a bog standard tent on top. Spare wheels x2 – punctures are common off the beaten track! Winch – electric winches are expensive and require the correct bumpers. It depends how extreme the offroading you’re planning is, but most people use their winches infrequently if at all on overland trips. A decent hand winch is a good compromise. Alternatively, a slightly more labour intensive winch can be rigged using your hi lift jack.